I just love this time of year! And one of my favorite things about the cold weather is getting to drink hot chocolate! So when it's time to entertain for the holidays, I love to set up a "hot chocolate bar" for my guests. I like to make entertaining simple, but let's face it. It always involves cleaning. So I was excited when I was asked by Home Depot and Procter & Gamble if I would take part in their Seasons Cleanings challenge. They provided me with some great Procter & Gamble cleaning products to use, and I got to get my house ready for Christmas entertaining by creating this cute hot chocolate bar. Here's what my fall buffet looked like. I loved it. But once I took it down, I had a bit of a mess on my hands, as you can imagine. So I set about cleaning up. 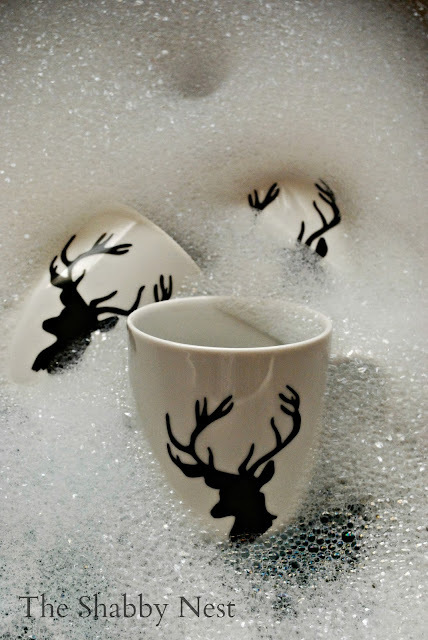 I found these adorable deer mugs on one of my holiday shopping trips, and they set the theme for the display. So I gave them a quick bath, and got them sparkling clean. Once I had everything clean, I set about creating the hot chocolate bar. To make the backdrop, I used some plywood from Home Depot...and some old pallet wood. (I picked up some other goodies at Home Depot while I was there). My dad helped me out and attached the pallet wood to the plywood backdrop using wood glue. And after it dried I had a perfect backdrop for my cardboard deer head. This idea came from one I had used my boys' bedroom previously...and I knew it would make the perfect Christmas-y display. Then to set the mood, I used different sizes of white cake plates (to create levels for the display), some chalkboard art that I created, some chalkboard-themed napkins, the deer mugs, adorable straws, and - of course - marshmallows galore. Now the hot chocolate bar is all ready for holiday entertaining! And today, the good people of Home Depot and Procter & Gamble are giving one lucky Shabby Nest reader the chance to win a $200 Home Depot Gift Card and some Procter & Gamble cleaning products so that you can get your home ready for the holidays! To enter simply leave a comment on this post. It's as easy as that! The giveaway is open until Wednesday, December 11 at 11:59 pm MST. A winner will be chosen randomly and announced on the blog later this week. This post is in conjunction with a sponsorship by Home Depot and P&G. The opinions expressed are 100% mine. I love your hot chocolate bar. Looks great, now I want some hot chocolate! Beautiful! 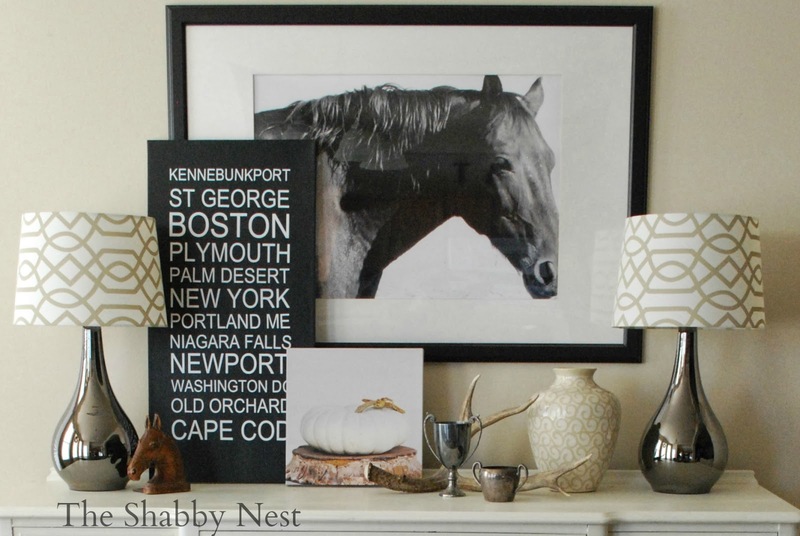 I especially love the deer head mount! It's looks stunning! I love the idea of a Hot Chocolate Bar. I love, love, love the felt trees and the deer head. Great stuff. We are completing a lot of home improvement projects so this would be great! Great giveaway....chocolate is perfect every time of the year. This would be amazing. We are in the middle of a giant mess while finishing our basement. Love how it all cam together, so creative! Love the mugs! Thinking of doing a hot chocolate bar myself. Thank you for the giveaway. I could sure use some things from home depot. Merry Christmas. Love the fall buffet and white cake plates idea, beautiful and lovely. Super excited for your chocolate bar inspiration! As well as the giveaway!! I hate to be a copy cat but its just too fab not to! Thanks for sharing your creative mind and the great giveaway! Love it all! Just Lovely! Just prefect for the holiday season! I love hot chocolate this time of year! I can't get enough! The hot chocolate bar looks awesome! I definitely need some help cleaning up for the holidays. I'm gonna have a full house! That looks adorable - I love the mugs!! Awesome giveaway! My hubs would love those coffee cups! Looks lovely! What an adorable theme! Love me some hot chocolate! Those are two awesome brands! Thanks for the giveaway!! Perfect Hot Chocolate Bar! Love the Reindeer on the wood! Hope I win - our neighborhood has been snowbound with low -10 deg. F. and 8 inches of snow. We could use a party with a Hot Chocolate Bar! I'll be stopping by for some delicious hot chocolate! Your deer theme is really cute. I just bought a deer pillow and I'm working on a foam-core deer head so I'm into deer this year too. thank you so much for the giveaway. I can think of several things I need at Home Depot for the holidays. I love the hot chocolate bar! So fun! Love the hot chocolate bar. My kids will be home from college Wednesday so tomorrow I have a week's worth of cleaning and decorating to get done. First up...set up my hot beverage station so it's ready when they hit the door Wednesday. Great Hot Chocolate bar! I always love them when I see other bloggers set them up, but I can't seem to find room for one! Maybe the buffet in my dining room. The wheels are spinning in my mind. Thank you so much for the chance! This is awesome! Thanks for the opportunity! In typical kid fashion, the marshmallows are always the first to go when I set up a hot chocolate bar! This is beautiful! I really love the deer head. LOVE it!!! 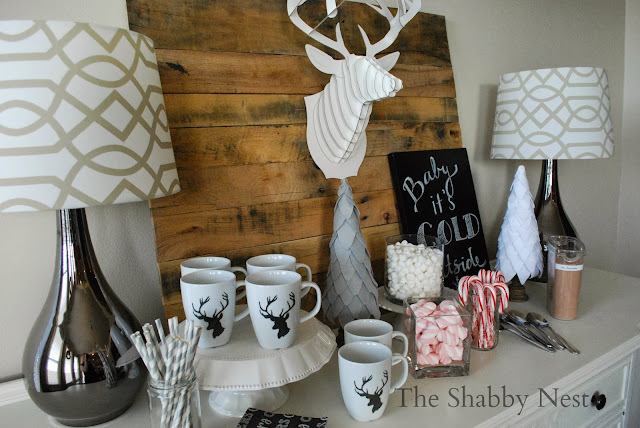 I want to create a Hot Chocolate Bar this Christmas and it is nice to see how to set one up. Thanks so much! What a great hot chocolate bar! I hope I win some DIY cash! Great offer...at a great time of year! I would love to win this...to help me with the cost of buying my Mom a snow blower this year. She just can't handle shoveling anymore & she can't afford to buy one herself...so I offered...ha, didn't realize they were close to a $1,000! haha This would help a lot...thanks for the chance! Love those mugs by the way! Love your blog and your hot chocolate bar...the kiddos must love it too! Happy Holidays! What a lovely set up! Thanks for the chance to win! There is nothing like hot chocolate on a cold winter's day. 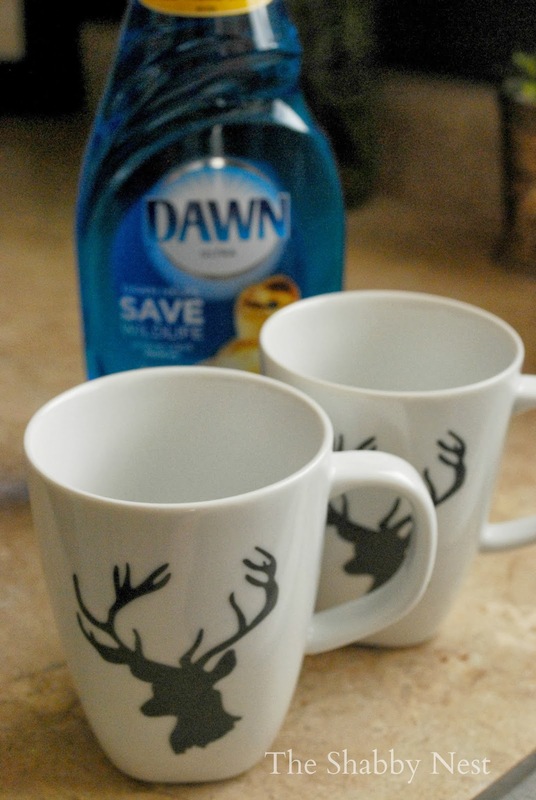 Love the deer mugs. What type of hot chocolate do you use? Do you make your own mixture? Love your blog! Just got back from Home Depot! Sure could have used that gift card! I would love to win to complete a shelving project in my office! The idea of a hot chocolate bar is brilliant. Thanks for the giveaway too! Love your hot chocolate bar. Love the hot chocolate bar!! Thanks for the chance! My kids would love a hot chocolate bar! Love the hot chocolate bar! Thanks for the great giveaway too! I love this idea!!!! Who doesn't like hot chocolate? Love it! You are so inspirational! What a great idea - thanks for the giveaway. Love the Hot Chocolate Bar and can't wait to try it out! Thanks for the chance to win too! I love that idea of a hot chocolate bar. Does Dawn work in cold water, I wonder? My reason for asking is because my kitchen sink is right above two rather air-leaky windows and with sub-zero temperatures already, the frost build-up and condensation has been awful. I can't afford to replace the windows, so I've been using coldish water to wash my dishes, trying to cut down on the steam that rises when using hot water to wash my dishes. I don't have a dishwasher, everything is done in my double sinks. I need something that will cut grease and clean with ease even with cold cold water, brrrr! I love the deer mugs and the felt trees. I have been looking for a craft to do with my girls when they come home for the holiday, and this may be it. Thanks. I am going to have a hot chocolate bar this Christmas Eve. Merry Christmas! 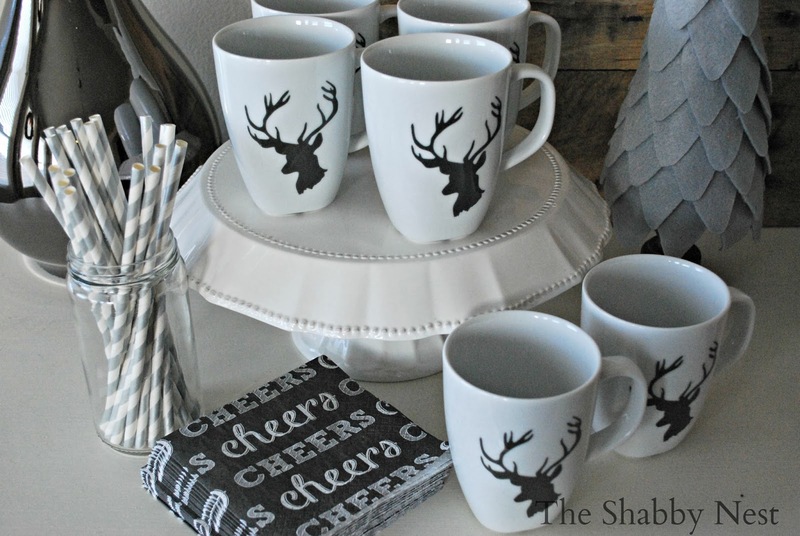 love love love the deer mugs and the tree's!!! The whold concept is fabulous!!! And it just so happens that I have alot of these items on my grocery list as well!!! Great minds think alike, lol !!! Thanks for the great blog, just happened upon it today!! I'm cracking up right now because all morning I've been singing Baby It's cold Outside and when I clicked on your post the first thing I saw was the Baby It's cold Outside sign, haha! Love it!! I love your hot chocolate bar! Your peppermint hot cocoa bar looks amazing! so beautifully done! i love the mugs, where did you find them! ?